Under a dark, pre-dawn sky, the launcher's main engines roared to life on time and the Soyuz rocket, trailing a sky-lighting plume of fiery exhaust, climbed away at 7:10:55 p.m. EDT (23:10:55 GMT). During launch Thursday, live television views from inside the spacecraft showed Kelly in the Soyuz TMA-01M's right seat, with Kaleri in the center seat and Skripochka, making his first flight, to his left. All three appeared relaxed and in good spirits as the rocket accelerated toward orbit, smiling and occasionally waving at the camera. 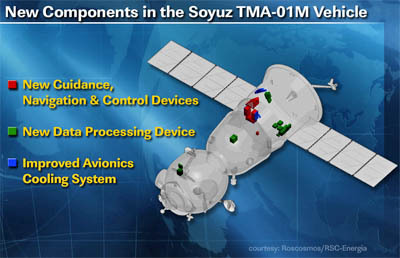 The Soyuz TMA-01M spacecraft features a variety of avionics and computer upgrades that are being flown for the first time. It was not immediately known if the unspecified issues referred to by Solovyov involved any of the new equipment.